Kunice is a village in the Central Bohemia region, 20 kilometers southeast from Prague, the capital city of the Czech Republic. The way to Prague city center takes 20 minutes by car on motorway D1 (exit 15 Vsechromy/Velke Popovice), which pass nearby the village or 35 minutes by train from Strancice railway station to Prague central railway station (Praha-Hl. n.”). Strancice is a village next to Kunice. Between Kunice and Strancice there is a bus connection (line 461). For actual connection with Prague please click To check the connection, please click here. By the way Strancice are known as birthplace of Mr. Emil Kolben, famous Czech industrialist. The village Kunice has 5 parts – Dolní Lomnice, Horní Lomnice, Kunice, Vidovice, Všešimy. All together has about 1400 permanent inhabitants and there is more than 400 cottages for recreation. Kunice has 4 restaurants, elementary school, kindergarten. Sport center, playgrounds, ponds. The origin of the name Kunice has two ideas - Kun (horse in czech). There used to be a business trail above Kunice, connecting Prague and Wien (Austria). The tradesmen relay their horses there (at the Manor in Vidovice). The second idea says a farmer by name Kuna, who settled there. Kunice were probably founded in 1350, but the legend in the church of the Saint Mari Magdalena situated in village common in Kunice says 970. The gothic church as we know nowadays was built during 13th century. 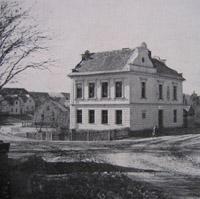 On the same village common we can also find the elementary school building, which was constructed in the year 1900. Right next to the school you can also find the building of municipal office, originally local private credit union. There are also two monuments of the world wars (1st World War opposite of Municipal office, 2nd War war on the school building). You can also visit a pond called “Zlabky” and sport areal Kunice-Vidovice, seat of sport union TJ Kunice with football fields. Next to it there are tennis courts, playgrounds for children and Chateau Berchtold with beautiful park. Chateau Berchtold is used as hotel and restaurant. There are three other restaurants in the village “Na Stare Fare” (in Kunice opposite of the church), U Fousku (in Vidovice in the centre of village) and U Palu (Dolni Lomnice, in the centre of village). Don´t forget to visit also famous view-point called “Bílý kámen” (“White stone”), where you reach the place where old business trail Prague-Wien was. From this spot you can have a magnific outlook in good weather conditions. In the past, there were founded four places called "Kunice". Three of them you can find in the Czech republic. First is Kunice, Central Bohemia region (15 km southeast from Prague), Kunice, South Moravia (40 km north from Brno) and Kunice in the West Bohemia region, "mountain Doupov", but this village was destroyed in the last century, when army started to use this area as the "army area". The last one is situated in Poland(www.poland.pl).